1) James to draft a document detailing the decision making process, based on the tracker and the discussions. James is still working on this and is in communication with interested parties. James raised the question of whether there should be different panels for different tasks. James raised the question of how panels are chosen; who chooses them. Poul discussed the pros and cons of independent panels for each area; panels can be made up of experts, but lack of overlap could lead to fragmentation of goals. Andrew suggested we could use existing decision making models; IETF and W3C examples. James will update and distribute the decision making document. Who gets to vote; who decides who gets to vote? 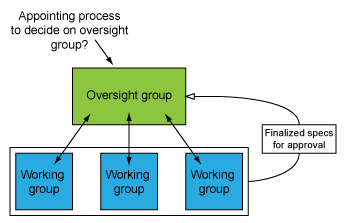 Poul put forward the idea that the current committee form the oversight group, and that ad-hoc committees are formed as working groups on different areas. Randall thought that perhaps the current group represents a working group on CellML core spec, and that the group may need to be changed to reflect a more balanced outlook. Andrew raised the question of how does the oversight group choose who replaces members who leave? Randall thought that currently there is no need to formalize this process, that decisions can be made when the time comes. Andrew's opinion is that a clear process reduces uncertainty and reduces the number of recurring discussions. Poul stated that he thinks the two level structure is important. Action item 1.) James to draft an email on this topic to the community. Catherine said that Peter is keen for everyone who wants to go to go. There was discussion on who is eligible for a grant; this needs to be investigated. James said that abstracts should probably be on the subject of work between now and the middle of 2009. Catherine said that Abhishek is no longer interested in this. James has added Abhishek's ideas to the roadmap. Poul will talk to Abhishek about keeping in touch with Sarala. Andrew will clear the moderation flag on team@cellml, now that Abhishek knows the purposes of the different lists. Nothing on the core spec. James has been looking at the Dublin Core tutorials on how to build constrained vocabularies etc. Dublin Core seems to have broadened to include: citations, keywords, etc. Randall brought up prioritizing the graphing and simulation metadata to bring PCEnv up to date. Andrew can work on bringing PCEnv up to date on these metadata. Andrew has finished the RDF API; ready to move the metadata handling in PCEnv to the CellML API. Ready to improve the graphing and simulation metadata. Randall mentioned Andre is very keen to prioritize the Java wrappers. Can this be balanced with the metadata spec? Poul would put the Java wrappers at higher priority. Justin is working on the Mac OS X build, using the XUL SDK to avoid building Mozilla on Mac. Catherine mentioned that Frank Sachse is keen to see a Mac version of PCEnv for teaching purposes. Andrew has been fixing minor bugs. The RDF API is complete. Catherine described the good feedback on the wireframes. Gareth is going send out new versions of the wireframes, (with changes according to the feedback so far) to the community for further feedback. Content update needs to be done. Gareth to select some free stylesheets or skins for Plone, which we can edit to suit our needs. We may decide to get some professional opinions from a designer on our in-house design. The deadline for the new site is the workshop. Catherine curated the Vaseghi model. Catherine, Randall, Justin, James and Andrew have been working on the Pasek 2006 model. Tommy has been building tests; Plone objects passed these tests so far. Tommy has been working on putting Plone and Mercurial together. Catherine asked; is checking for broken links is worth it? Randall said that all PMR1 content will be migrated to PMR2 so broken links do need fixing. Andrew mentioned the existence of a script for finding broken links. Action item 3.) Tommy to find and execute a script to find broken links. Catherine would like a simple "edit documentation and re-expose" workflow for PMR2. Catherine asked Andrew about progress on the SBML to CellML prototype; there has been no further work on this. James asked about Matt's Plone 3 "proposals" software, for software centre. Randall suggested continuing to use the tracker for proposals.